A standard dessert and comfort food that both Mom and Grandma made was tapioca pudding. They both used the recipe that was right on the Minute Tapioca box -- usually the variation that used meringue to make it nice and fluffy. It was served warm or cold. 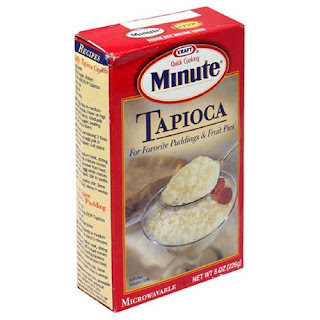 There was always a box of Minute Tapioca in the cabinet. Besides making pudding, tapioca works well as a thickener in pie fillings.